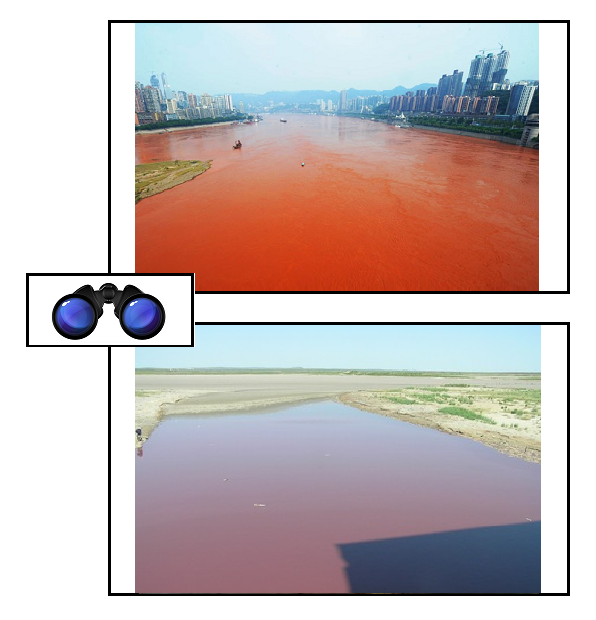 NDTV reports that Chongqing’s Environmental Protect Bureau is blaming sand for the color change in the river. They claim flooding upstream washed sand downstream which turned the river red. But what it it’s the apocalypse? So — when you see red water, do you think “aha! daub time” or “ooh, chromatiaceae” — or “OMG, it’s the end, it must be”? Do you prefer to get your explanations for curious events from science, or from religion? This entry was posted on Sunday, September 9th, 2012 at 11:37 pm	and is filed under America, Apocalyptic, art, blog-friends, Charles Cameron, china, Clausewitzian, scriptures, Uncategorized. You can follow any responses to this entry through the RSS 2.0 feed. Both comments and pings are currently closed. for the good that I would, I do not: but the evil which I would not, that I do. Sorry folks, comments are back on.